Countdown To Christmas three designs stitched on the popular 14ct Aida Banded Ornaments with Christmas trim. Stitch counts 35w x 31h, 33w x 33h, 32w x 33h. Coffee stitch count 40w x 66h, approximately 2 3/4" x 4 3/4" on 14ct. The First stitch count 91w x 63h, approximately 6 1/2" x 4 1/2" on 14ct. Change (Can Be Beautiful) stitch count 64w x 91h, approximately 4 1/2" x 6 1/2" on 14ct. Sandy's Pincushion stitch count 45w x 45h, approximately 3 1/4" x 3 1/4" on 14ct. Easter Towels stitch counts 141w x 36h, 140w x 36h, approximately 10" x 2 1/2" on 14ct. It Was Not Nails stitch count 66w x 91h, approximately 4 3/4" x 6 1/2" on 14ct. Happy Easter Pillow stitch count 77w x 77h, approximately 5 1/2" x 5 1/2" on 14ct. Spring Song stitch count 98w x 126h, approximately 7" x 9" on 14ct. Easter Joy Buggy stitch count 143w x 69h, approximately 10 1/4" x 5" on 14ct. Welcome To Our Coop stitch count 74w x 106h, approximately 5 1/4" x 7 1/2" on 14ct. Farm To Table stitch count 93w x 65h, approximately 6 3/4" x 4 3/4" on 14ct. I Believe (I believe in the sun even when it's not shining, I believe in love even when I don't feel it, I belive in God even when he is silent) stitch count 135w x 107h, approximately 9 3/4" x 7 3/4" on 14ct. 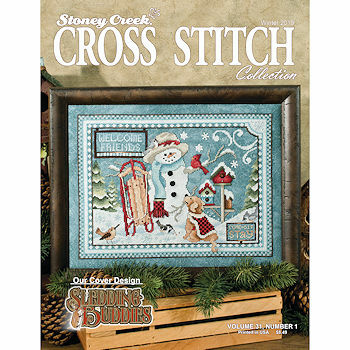 Frosty's Peeps stitch counts 55w x 43h, approximately 4" x 3" on 14ct. Just Ducky! Bookmark stitch count 27w x 98h, approximately 2" x 7" on 14ct. Sledding Buddies stitch count 184w x 142h, approximately 13 1/4" x 10 1/4" on 14ct. Who Needs A Therapist stitch count 78w x 49h, approximately 5 1/2" x 3 1/2" on 14ct. Divisions of Nature Series - Spring stitch count 150w x 38h, approximately 10 3/4" x 2 3/4" on 14ct.